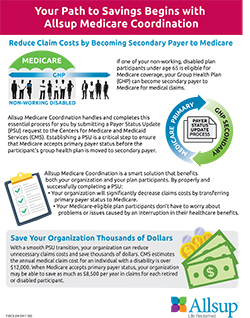 Allsup's comprehensive Medicare Coordination offer employers a proven way to establish and maintain the highest possible level of group health plan savings. Covered by a group health plan with 100 or more participants. 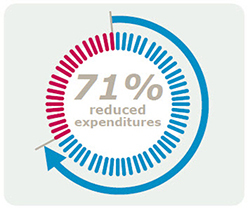 Reduce future group health plan expenditures by approximately 71 percent for these individuals by converting Medicare to primary payer. Identify nonworking disabled plan participants who are entitled to medicare as primary payer. Update Medicare payment status by submitting payer status updates to the Centers for medicare & Medicaid Services (CMS). Enroll nonworking, disabled plan participants in Medicare Part B without penalty under federal Disability Special Enrollment Period (DSEP) provisions. Monitor disabled plan participants who will become entitled to Medicare in the future. Represent disabled plan participants for SSDI, which results in additional benefits for the individual, including Medicare eligibility, increased Social Security retirement benefits and return-to-work incentives. Resolve CMS Demand Notices requiring reimbursement for charges allegedly paid by Medicare as primary payer in error.